In the follow-up to yesterday’s post on wages and investment, it is interesting to assess what stimulates and impedes firm investment. Research finds leverage is determinant to firms’ investment decisions when subject to cyclical constraints such as those imposed to European firms between 2011-2016. In other words, market interest rates exogenous to the firm affect firms’ investment decisions conditional on firm indebtness. Less explored is the role of policy makers in signalling macroeconomic conditions where firms operate. Whereas uncertainty, in prices or demand, are typically found to affect investment, another less explored signalling channel, the Central Bank interest rate, seems to influence as much. Research for the Reserve Bank of Australia concludes that, although firms’ rate of return required to invest is the result of variables other than the Central Bank’s interest rates a signalling channel appears to exert some influence in firms’ decision to invest. According to Lane and Rosewall’s research for the RBA, a seldom updated hurdle rate prevents firms from recognising improved investment opportunities in lower policy interest rates. The complex chart above plots US indicators indexed to 1998 between 2000 and 2010. The chart plots interest rate policy effects (10-year Treasury yield, light blue) and how it eventually impacted corporate bond yields (Baa, purple). The ratio between the two rates (dark red) peaked as the corporate debt lagged the policy interest rate and dipped afterwards until 2005. Firms’ capital intensity (orange) behaved accordingly increasing until 2005 and decreasing as the corporate-to-public debt yield ratio began to increase in 2007. Even as profits (green) dropped from 2007 onwards, firms kept adding debt (dark blue, indexed to 2000), profiting from lower corporate debt rates and ignoring the interstate rate’s steep ascent started in 2006. Although such superficial research is ineffective in finding what motivated firms to continue borrowing despite increasing yields, investment bank deregulation in 2004 certainly increased market supply of corporate debt. 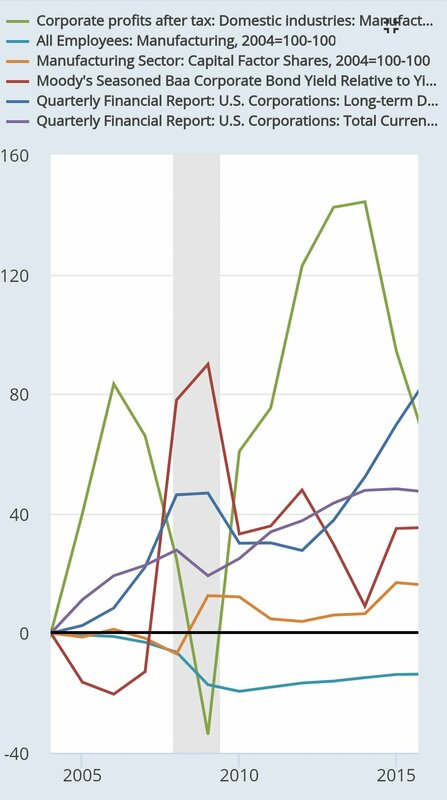 Plausibly, manufacturing corporations increased ownership of non-productive assets (cf chatte below, current assets, purple) and indebtness (dark blue), becoming more vulnerable to financial market events. 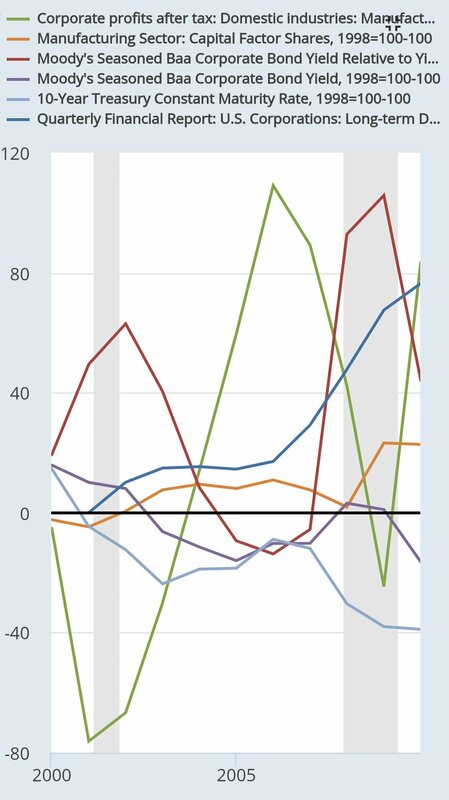 Although it likely contributed to higher profits (green) without increasing (productive) capital intensity, the decline in manufacturing employment and capital intensity after 2004 created a more feeble economy with lower aggregate earnings and domestic demand. Corporate financialisation plateaued in 2014 even as corporate indebtedness continued a rapid ascent started in 2012 – at least, firms are now investing in productive assets (or so it seems). Concluding, whereas firms’ investment decisions are typically unrelated to macroeconomic developments, aggregate borrowing and financialisation seem somewhat sensitive to regulatory changes affecting the opportunity-cost of investment.